China is keenly examining the project designed to build a rail link between Armenia and Iran and expressed its interest for bringing it into its fold under “One Belt, One Road” project. This was announced by Jian Aiming, the head of the Department for Eurasian Affairs of the Chinese Civil Engineering Construction Corporation, in a meeting with Armenia’s Minister of Transport, Communications and Information Technology Vahan Martirosyan. Aiming was quoted as saying in a press release that China’s Ministry of Commerce would discuss the inclusion of this project in the “One Belt, One Road” program. He added that after the discussions were over, the corporation would be ready to conduct a feasibility study of the project. Martirosyan stressed that the rail construction is of strategic importance for Armenia and expressed readiness to discuss this issue with China’s trade minister. The agreement on the construction of the rail link was approved by Armenian and Iranian governments in 2009. In 2012, the Dubai-based Rasia FZE Investment Company was granted a 50-year concession by the Armenian government to build and manage the 305-kilometer railroad from Armenia to Iran, to be named the Southern Armenian Railway. By late 2013, Rasia FZE developed a feasibility study for the project, estimated to cost $3.5 billion. The high cost is explained by mountainous terrain through which it is supposed to pass. Specifically, the 305-km-long railroad was to cross 64 bridges spanning 19.6 km and 60 tunnels extending over 102.3 kilometers. The Armenian government said the railroad was to run from Gagarin Station in Armenia’s Gegharkunik Province to Agarak in southern Syunik and may transport cargo totaling 25 million tons a year. It was also said to provide the shortest transportation route from the ports of the Black Sea to the ports of the Persian Gulf and establish a major commodities transit corridor between Europe and the Persian Gulf region. China Civil Engineering Construction Corporation Ltd. was established in June 1979 under the approval of the Chinese State Council. Its business scope expands from international contracting for railroad construction to civil engineering design and consultancy, real estate development, trading, industrial investment and hotel management as well. The business activities of CCECC have expanded to over 40 countries and regions where more than 20 overseas offices or subsidiaries have been established. 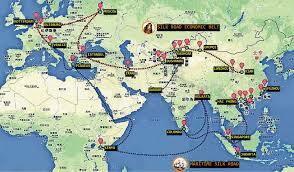 The One Belt and One Road initiative is a development strategy proposed by the Chinese government that focuses on connectivity and cooperation between Eurasian countries, primarily China, the land-based Silk Road Economic Belt and the oceangoing 21st-Century Maritime Silk Road. The strategy underlines China’s push to take a larger role in global affairs with a China-centered trading network. It was unveiled by Xi Jinping in September and October 2013 for SREB and MSR respectively.